Before the summer ended last May, we were able to squeeze in a trip to Dumaguete. On our second day there, we ventured off to Apo Island, Dauin, Negros Oriental, which is known as a good dive spot and is also famous for the sea turtles. To get there, you need to drive 1-2 hours from Dumaguete proper until you reach the drop off point where you can park your car, and ride a pump boat to the island. Fortunately, one of our friends lives in Dumaguete and booked the boat beforehand. Being used to soft, white sand beaches (See my Boracay post here. ), and island hopping, I was a bit surprised to find that the sand here was topped with a lot of small stones. Expecting a normal cottage, I was also surprised to find a lone makeshift wooden hut. The local folk were kind enough to offer use of their bathroom but the place and the bathroom water didn't really smell so good (according to my friend) so I didn't bother entering. They also offered to buy and cook our food for a price but we would then have to buy a very large fish so we decided to just order food from the nearby resort. Along with the rest of the items that surprised me, I also wasn't prepared for all the large rocks and corals we would be encountering. Lol. You just cannot tread these waters without proper beach footwear - which the majority of us did not have. 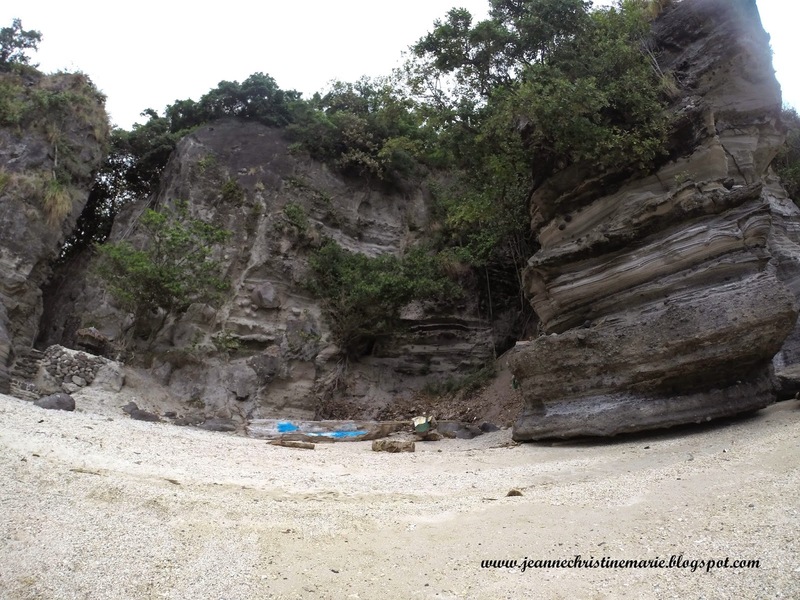 However, the guides came prepared with life jackets, snorkels, and footwear for rent - each for P100. (So yes, the jacket + snorkel + footwear cost me an additional P300.) DEFINITELY bring your own beach shoes if you come here! All of those unexpected things were of no matter to me. Off we were to a new adventure! I've never been swimming with large sea turtles before so imagine the excitement when our guides spotted the turtles and led us towards them. We saw a mama turtle and a baby turtle. The baby turtle was camera shy and kept swimming quickly away before you could even get near it. This area is protected by the government. You're not allowed to step on the corals or touch the turtles or else you will be charged with a fine. It was comforting to see that the guides actually took this law seriously and watched us to make sure we obeyed. However, the mama turtle actually kept swimming wherever she pleased, not caring if she'd accidentally hit humans. Haha. I'm not much of a swimmer so this was as close as I could get. If I ever get the chance to swim with turtles again, I will definitely ditch the life jacket (for a short while) so I can get just a liiiiiitttle bit closer.. Thanks for sharing this place! I would love to go here. :) The turtle is so cute. Visit my blog? We can follow each other via gfc and bloglovin if you want, just leave me a comment! Wow!!!! What an amazing experience!!!! I wish I could do that!!! Amazing. Would you like to follow each other on GFC?! Let me know and follow me on my blog, I will follow you right back on both GFC and Bloglovin! These were such nice photographs! I hope you had a great time! so beautiful! thanks for sharing stunning views! what a beautiful beautiful place and I love turtles! Btw, I'm also a fashion/beauty blogger. would you like to follow each other on bloglovin? Let me know! What a beautiful photos! It looks like the most perfect place and it sounds like an amazing experience to swim with turtles! Beautiful photos! Love this post! Aw, swimming with turtles, how wonderful! These photos are so awesome! I love snorkeling and I love your underwater photos! Thank you so much for sharing! Beautiful pictures and it looks so much fun! Wow what an experience and you sure got some fantastic pictures. Spectacular pics. Thx for sharing with us. Lovely pictures, it looks like paradise. Swimming with turtles seems like a dream, but I am a big ole' wuss and would never have taken my jacket off lol. Seriously though, what an experience! The place is really beautiful and looks like a really great location to relax! Thanks for the recommendation. wow, the water is so beautiful! This looks like such a lovely place to go! I love turtles so swimming with them would be such a great experience!